SASS: SANCA’s Annual Spring Showcase! 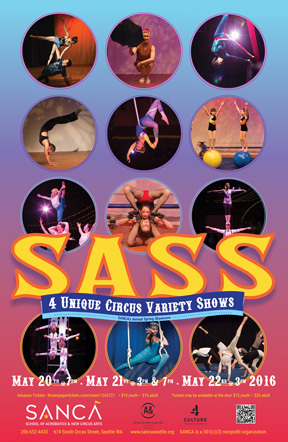 Celebrate spring at the SCHOOL OF ACROBATICS & NEW CIRCUS ARTS’ Annual Spring Showcase–SASS! Each May SANCA presents a showcase of unique, circus-variety performances with students, alumni, staff, and friends of SANCA. For one weekend only, you can see FOUR super exciting circus shows, each featuring a different line up of spectacular local and internationally renowned circus artists alongside SANCA’s tremendously talented student performers. With festive musical accompaniment by Doc Sprinsock & the SANCApators, audiences will be treated to daring displays of acrobatics, high-flying aerials, rolling globe ensembles, contortion, juggling, and more! In this new, thrillingly beautiful work, Acrobatic Conundrum transports audiences to a captivating world seemingly free of the bounds of physics, but not free of the capricious struggle for human connection. Fluent in the language of acrobatics, this cast risks all on a quest to tell honest accounts from an uncharted territory. Real life romances are portrayed through mesmerizing juggling acts, breathtaking aerial and partner acrobatics — all while balancing on a bar 20 feet in the air! This show will upend everything you thought you knew about these two laws of attraction: Love & Gravity. Features: Carey Cramer, Terry Crane, Scotty Dont, Erica Rubinstein, Xochitl Sosa, Ty Vennewitz, and local special guests, Alex Allan and Anna Thomas-Henry. “This show will be a special benefit show for SANCA, featuring guest appearances from SANCA artists and staff. Net proceeds from this show will go towards SANCA’s programs recognized nationally as a leader in youth circus arts education, safety, and instructor training. with Special Guests Splinter Dance & The Georgetown Orbits! After many weeks of work, we’re just a day away from Up with a Twist! Saturday was one of the last rehearsals before the show. Friends, family, staff and performers all came together to eat, rehearse and make last minute preparations for the big day. This year’s Up with a Twist is sold out, and for good reason. Not only does this show support SANCA’s vital programs, it’s an outstanding production showcasing some of of our most talented performers. If you didn’t get a ticket this year, be sure to tune into our Twitter, Instagram and Facebook for a live feed of the show, featuring pictures, clips, and interviews with the performers and audience. All three youth performance troupes take direction from their director, David Crellin. Coach Mary practicing her LED Hoop routine for the packed north annex! The Cicus 1-ders, our youngest performers, worked hard all day fine tuning their performance with the dedication and discipline of performers much older. Director David Crellin and MC Kevin Joyce discussing cues while Cirrus perfects their table routine. HOTEL is the tale of a once-grand institution that has fallen on hard times. A thick layer of dust covers the concierge desk and the rooms sit unoccupied. When two unsuspecting guests arrive to stay the night, little do they know, they are in for a wild ride. With portraits that swing out of their frames, a fountain that comes to life, acrobatic bellhops and juggling ghosts, it’s clear…this is no ordinary hotel! Cirrus Circus is known throughout Seattle as one of the most accomplished youth circus groups in the region. The troupe is in demand locally, performing at many of Seattle’s popular festivals and events, including Moisture Festival, Seattle Center’s Winterfest, the Georgetown Carnival, and more. In July 2014, Cirrus Circus had the honor of performing internationally at the London International Youth Circus Festival in England, at No Fit State in Cardiff, Wales and Island Circus in Sylt, Germany. HOTEL will feature all-new original numbers on trapeze, aerial fabric, aerial hoop, and Chinese pole, as well as contortion, club juggling, unicycle, partner acrobatics, clowning, and more. HOTEL is a collaboration between the Directors and members of Cirrus Circus, with costume design by Milla Voellinger, set by Morgan Sobel, acrobatics consulting from Jacob Skeffington and Erica Rubenstein, and select originally composed music by Tristan Moore. SANCAthon: it’s back, and bigger and better than ever! Thank You to everyone who made SANCAthon a success! SANCAthon is a super fun community celebration! We’ve got exciting plans for this year’s SANCAthon and you don’t want to miss it! Read about all our exciting team events at the SANCAthon Team Page. You can make contributions in support of teams or individual participants from their team and personal pages. Our goal is to make as many catches in one hour as we can! Join us in the SANCA School of Flight Tent to kick off SANCAthon at 12 p.m. on Sunday, November 1st. We’re taking on the challenge of climbing the height of the Space Needle as many times as possible in one hour! Are you a climber? We’ve got your apparatus– rope, fabric, trapeze, or Chinese Pole, this event’s for you! Wire Walkers and Unicyclists: We’re going to cross the width of the Grand Canyon in a relay-style event especially for tightwire walkers and unicyclists! We will attempt a wave of handstands around the whole gym where everyone will hold a handstand for 15 seconds before the next person goes up in a relay fashion! The SANCAthon juggling team is all about three things: Throwing, catching & raising funds for the SANCA Youth Scholarship Fund. We are setting our sights on achieving the group goal of 2,015 catches in any juggling pattern and with any juggling prop, be it bean-bags, balls, rings, or clubs. It is as the old juggling saying that we just made up goes: You gotta throw ’em if you wanna catch ’em. SANCA’s tumblers are going perform a demonstration of the awesome skills we’ve learned for everyone to see! We’ll dazzle you with rolls, handstands, cartwheels, or crazy tumbling passes. SANCA’s 2 – 4 year-old tots are going to tear it up at the TURBO TOT OBSTACLE COURSE! This incredible, super fun obstacle course will include Wacky Wall Walkers, Balancing Feathers, Juggling, Monkey Jumps and More! Contribute in support of performers at their team & personal pages from the SANCAthon Team Page. The Amazing Circus 1-ders and the Magnificent 7 – accompanied by the SANCApators Band — will close out the day by with some amazing new performances. You may be witness to the debut of AcroVengers: Origins, as well as an amazing aerial ladder act, a tumbling and springboard act, and a new ring juggling act. Cirrus Circus and our staff performers will give it their all for you! Challenge our performers to achieve amazing feats of daring do by putting down a donation for a trick. Want to see an acrobatic three-high? Juggling 7 balls? A dueling unicycle challenge? Show us the $$, we’ll show you the tricks! Random Acts of Circus will happen throughout the day, and you’ll have opportunities to enter drawings for fabulous prizes. See you Sunday, November 1st for SANCAthon! Flight of the Living Dead! The SANCA School of Flight is welcoming Fall with the Festival of Flight: Flight of the Living Dead! The Open House and Flying Trapeze Shows are a celebration for the whole community. First time flyers are encouraged to try flying on the trapeze during our Open House and to stay for the Flying Trapeze Shows that feature the School of Flight team flyers performing high-flying tricks and feats of derring-do! The flying trapeze will be open to participants throughout the Open House. Space is limited, one turn per person. Participants must be 4 years old to fly. Please bring a contribution to SANCA’s Youth Scholarship Fund or a nonperishable food item for the Rainier Valley Food Bank if you would like to fly! The SANCA School of Flight Open House is a celebration for the whole community! First time flyers are encouraged to try flying on the trapeze. The flying trapeze will be open to participants throughout the Open House. Space is limited, one turn per person. Participants must be 4 years old to fly. Turns on the flying trapeze are available for a contribution to SANCA’s Youth Scholarship Fund or a nonperishable food item for local food bank. Shows are non-ticketed events. Contributions are welcomed at the door. The Improbable Return of the Amazing Scotty Walsh! With a magician, anything is possible, including reappearing at SANCA just in time for the school’s annual Staff Show – The Circus Animal: A Nature Documentary. SANCA is delighted to welcome back Scotty Walsh – one of our earliest circus students and coaches. Scotty is visiting SANCA from Cork, Ireland during the month of August, working in collaboration with Kelsa Dine. Together, they will debut a new act called “The Smiths.” Scotty and Kelsa took time out from their busy training and performing schedule for an interview with SANCA. SANCA: Scotty, you’ve been a performer for some time now, how did you get your start? Scotty: I was eight when I saw my first magic show. It was Mike the Magic Janitor. He was the janitor at Pomeroy Elementary School in Pomeroy, Washington, but he also did magic shows for the school at Halloween and for the town’s Tumbleweed Festival and County Fair. I was really inspired and started inventing magic tricks to show him, and I pestered him constantly about learning more magic. At one point Mike had a gig at the town Vaudeville Show, but he was unable to attend and asked me to do a magic show in his place. He helped me choreograph a show and taught me how to do it. That was my first magic show – for 400 people – when I was eight. That’s one of the reasons that I love to do shows for kids, because Mike the Magic Janitor had such a huge impact on me as a kid. SANCA: What came next in your magic career? Scotty: The Market Magic Shop at Pike Place Market had been an annual pilgrimage for me for years when visiting Seattle from Eastern Washington. I started working in the Magic Shop and also working as a street performer at the Market when I came to Seattle to attend the University of Washington for a degree in Political Science. SANCA: Political Science seems a far cry from magic and performance, what sparked that interest? Scotty: I lived in Kosovo for a year and I’d become really interested in humanitarian issues, and Political Science seemed a natural fit for that kind of work. I was also very active in the performance and circus community in Seattle at the same time – busking at the Market and juggling with the Cascade Jugglers. I also founded the Emerald City Circus as a student club at U.W. to create more community on campus for circus. SANCA: You were one of SANCA’s first adult students, and later even coached classes for SANCA. How did you discover SANCA? Scotty: I saw the Cirque du Soleil show “Dralion” and was very inspired – especially by Joe de Paul’s clown act in that show. I wanted to go to the École Nationale de Cirque (ENC), and started teaching myself dive rolls from Hovey Burgess’s book, Circus Techniques. At about the same time, Jason Williams and Evelyn Bittner (Dr. Calamari & Acrophelia of Circus Contraption) attended one of my shows where I was recreating Houdini’s Water Tank Escape. They told me about SANCA and I started taking classes to prepare for my audition at ENC. SANCA: After your time at SANCA you went to study physical theatre in Italy. What took you there? Scotty: I didn’t pass my audition at ENC, but SANCA was giving me everything I wanted to learn about how to perform acrobatics. There is a painting by Picasso which depicts the acrobat/clown Harlequin who descended from the Commedia dell’Arte – a copy of this painting, The Family of Saltimbanques, is hanging in Chuck and Jo’s [SANCA’s founders] office. That painting was always very inspiring to me and I felt my next step as a performer was to train in physical theater and the commedia. I discovered a school called the Accademia dell’Arte in Arezzo – in the Tuscany region of Italy. I was accepted to their 2-1/2 year MFA program in Physical Theatre. SANCA: Kelsa, how did you get started as a performer? Kelsa: I had an interest in theatre from an early age, and did performances in grade school, but the High School I went to didn’t have a drama department so I took voice lessons and sung in the choir. I went to college in Baltimore for a degree in Acting and Playwriting, and it was there that I also took classes in single-point trapeze. SANCA: What took you to Italy to study at the Accademia? Kelsa: During college I had the opportunity to do a one-month intensive at the Accademia dell’Arte. It was a really amazing experience that stuck with me. After college I decided to continue my studies at the Accademia. Scotty: Around that time I was planning my next degree – a Doctorate in Drama and Theatre with a focus on performance in mentalism. After graduating the Accademia I went to University Cork College in Cork, Ireland to begin my Doctorate. SANCA: Why mentalism? And what is mentalism? Scotty: Mentalism is a performing art that uses, or seems to use, highly developed mental or intuitive abilities. Mentalism is traced back to tales of the supernatural – clairvoyance in Greek myths or legends of second sight and witchcraft which emerged from the Scottish Highlands. I was very interested in the intersection of mentalism and physical theater because physical theater can develop heightened nonverbal communication to the point where it might be said to resemble “telepathy.” I want to reinterpret mentalism through the lens of physical theater. Kelsa: Much of physical theater is the study of proprioception – total body awareness – understanding the space surrounding your body and where you are in that space. It’s a type of sensitivity training. It’s this type of heightened sensitivity that often connects to acts of mentalism, which people can confuse with ESP or supernatural ability. SANCA: What brings you back to SANCA just in time for our summer staff show? Scotty: Last year, Jo invited me to perform at SANCA’s 10th Anniversary Circus Festival, and I had such a great time returning to SANCA and performing last year that I wanted to do it again. I was on summer break from UCC, so I called and asked if I could come back for the month of August, and if I could take part in the staff show and they said yes. Working at SANCA is such a positive and rewarding experience. I knew I wanted to find collaborators for a new act and SANCA seemed like the right place for that. My proposal to Jo was to have training time at SANCA to create a new act, and in return teach workshops for the SANCA community and the youth troupes. It is really important to me to give back to the community that has given me so much. Participating in the staff show is a bonus and I’m very grateful that they are letting us take part in the show. SANCA: You’ve been training at SANCA for a couple weeks now. What’s that experience been like? Kelsa: I’m really inspired by the collective circus groups you have training here – IMPulse and The Acrobatic Conundrum. Watching them create new work and how they are developing their acts through a group devising process is really exciting. Scotty: SANCA is an incredible place. There’s nothing else like it, and it’s changed my life immeasurably. I am always astounded at how the school enriches the people that come through its doors. For us, it’s been a positive and welcoming training environment. We’ve been able to get feedback on the act we’re working on, and that’s a really important part of the process – having constructive audience feedback in a safe environment while creating new work. Kelsa: Thank you for welcoming us. This is a fantastic place to work and train. Scotty: A show equal parts comedy and mentalism leading to an unexpected and inexplicable moment of truth. SANCA: How does it relate to the show theme – The Circus Animal? Scotty: There’s been some interesting research recently about telepathy in animals, examining the potentiality of animal telepathy, or really, methods of nonverbal, nontraditional communication that we are only just starting to understand. Kelsa: We’ll be representing that most unusual of animals: The Human Animal. SANCA: Is there anything else you can tell us about the act? Scotty: We’re liars, cheats, and frauds, and by the end of the show, you’ll wonder if we’re even telling the truth about that. You be the judge! Scotty Walsh and Kelsa Dine will appear as “The Smiths” for two weekends, Fridays through Sundays in SANCA’s Staff Show – The Circus Animal: A Nature Documentary, August 21-23 and 28-30. They will also appear at the family friendly August Vaudeville Revue at Kenyon Hall on Tuesday, August 25th at 7:30 p.m.
You can visit Scotty at his web page and learn more about mentalism at http://scottywalsh.com. Come see the never-before-revealed mysteries of the circus kingdom! Learn about the mysterious behaviors of the ring reptile, the night time aerial adventures of the spider, and the secret desires of the flamingo in this new mock-documentary show. Visit the wilds of SANCA and witness the strange and wonderful mannerisms of circus creatures in this new show featuring the original circus animal – HUMANS. This exciting collaboration showcases an amazing variety of traditional and modern circus arts, including Chinese pole, Partner Acrobatics, Aerial Rope, Handbalancing, German wheel, Aerial Rings, Slack Line and more! Saturday evenings join us for a jaw-dropping, awe-inspiring Late Nite show by the SANCA School of Flight staff and stay for an after-party in our fly tent sponsored by Fremont Brewing Company!